FAST-SELLING: The Santa Fe is a bit thirsty, but it has the edge in roominess on its rivals. My son and five of his friends are going on a road-trip camping holiday around the very top of Scotland next month. This North Coast 500 starts and ends in Inverness and for 519 miles takes in places like John O’Groats and Cape Wrath, much of Sutherland – dubbed Europe’s last wilderness – Wester Ross and Ullapool. It is absolutely magnificent and you want time, space and a comfortable vehicle to do it in. And it was on the last point that I got bit alarmed when hire companies – they are all flying into Inverness – started offering them cars like the Opel Zafira or a number of other so-called seven-seaters. Just imagining six strapping millennials, their luggage and camping equipment getting into one of these vehicles was horrible enough, but knowing that some of them would be robbed of really enjoying some of the finest views in the world by being jammed in the back, seemed to negate the whole purpose of the trip. Thankfully sense prevailed, and they are now sharing a nine-seater Mercedes-Benz Vito, which may be a lot more expensive but will make the whole trip so much more enjoyable. I envy them. The area has been part of my family history for hundreds of years. My parents are buried next to a beautiful beach along the NC500 and I have so many happy memories of all the time I have spent up there. It would have been good if I could have recommended one of the really excellent seven-seaters that I have tested over the last year, especially the award-winning Skoda Kodiaq and absolutely outstanding Peugeot 5008. But, while the two rear seats can be used for adults, they aren’t ideal for long trips. They soon become quite claustrophobic with windows that don’t open and luggage space being massively restricted. 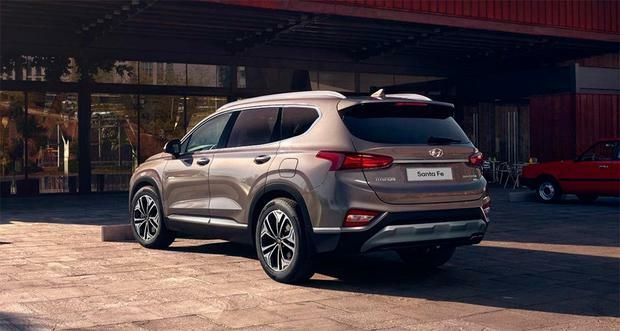 These two excellent cars have now been given some added competition by the launch of the all-new Hyundai Santa Fe, which has always had massive success in this sector but was starting to look a bit dated. The new fourth-generation Santa Fe is wider, longer and taller than the old model. Better-looking as well. It has successfully gone for a real premium feel, as well as trying to give a more open and airy environment for all passengers. At the moment it can only be powered by a 2.2 diesel across three trim levels, as well as 2WD and 4WD and six-speed manual or eight-speed automatic box. There are lots of very nice storage areas and all the seats are really very comfortable, although three individual seats across the middle row would have been better than the 60-40 split. I think the Santa Fe probably has the edge in roominess in the whole sector. There is a massive equipment list with some of the best safety devices I have tested. You don’t have to leave the entry level for most of it, although the 2WD Executive Plus model at €43,995 is the one to go for. Of course, Hyundai has that five-year warranty, and, as we reported last week, very high satisfaction and reliability records. I was driving the very top-of-the-range 4WD model and at that level the Santa Fe is getting pretty expensive at €57,495. It’s a very competent, if not exciting, drive, probably a bit thirsty, but I’d happily follow the lads around Scotland in it. It would be effortless driving. The bad news is that the 182 allocation is already nearly sold out, so Hyundai knows the Santa Fe is going to be very busy in 191 sales. The mysteries of marketing can certainly throw up some surprises. With little trumpeting Ford launched the Mondeo hybrid — more economical, less polluting, and thousands of euro cheaper than an equivalent diesel-powered model. The Mondeo has been with us for many years but gets the latest hybrid, low Co2 technology. Enter the all-new Focus, which goes on sale now. But surprisingly there is no mention of battery boost propulsion technology. No hybrid, no EV (electric vehicle), just a one-litre EcoBoost petrol engine and a 1.6-litre diesel. It seems inexplicable that the latest and cleanest technology is not in the mix. Not a battery pack in sight. The new model, full of info, safety and communications technology, arrives at a time when a low-emission hybrid would be well suited to the market. The new WLTP emission tests which are to come into force are stricter on economy and pollution matters than the current NEDC, now considered flawed, method of testing. Industry leaders like Ciaran McMahon, Ford chairman and managing director for Ireland, are warning that the new test could add up to an extra €3,000 on some models and are asking Revenue authorities to readjust the bands because the stricter tests will mean many cars moving into costlier VRT and road tax bands. And another aspect of shifts in the motor trade that must worry Ford is a new study by CarZone which indicates that two-thirds of car owners plan on buying an EV or hybrid vehicle in the near future. Worryingly, Ford of Europe seems to have been left a bit in the dark about EV and hybrid arrivals even though earlier this year the parent company in America announced an $11bn plan to produce 40 hybrid and full EV vehicles by 2022. A mild hybrid version — (battery pack powering only ancillary functions but not driving the car) is due in 2020. Expect a new EV vehicle for Europe for 2020 delivery. It will be based on a Kuga or C-max-sized SUV. The new Focus is smarter looking, is roomier inside thanks to a 53mm longer wheelbase. There is also an estate version on offer, and an ‘Active’ crossover-type version will be here next year to cater for the SUV followers. Prices start at €24,900 for the one-litre EcoBoost which puts out 125bhp. The 1.5-litre diesel has the choice of a six-speed manual or eight-speed automatic transmission. Both engines have been tweaked for greater efficiency.